Goodreads: The sins of the mother... 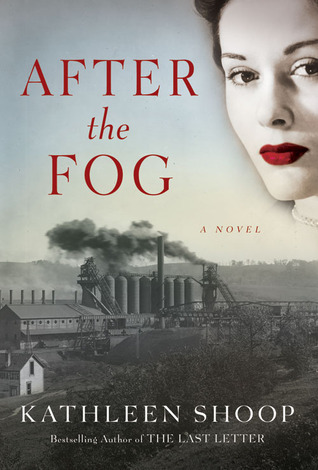 In the steel mill town of Donora, Pennsylvania, site of the infamous 1948 "killing smog," headstrong nurse Rose Pavlesic tends to her family and neighbors. Controlling and demanding, she's created a life that reflects everything she missed growing up as an orphan. She's even managed to keep her painful secrets hidden from her loving husband, dutiful children, and large extended family.When a stagnant weather pattern traps poisonous mill gasses in the valley, neighbors grow sicker and Rose's nursing obligations thrust her into conflict she never could have fathomed. Consequences from her past collide with her present life, making her once clear decisions as gray as the suffocating smog. As pressure mounts, Rose finds she's not the only one harboring lies. When the deadly fog finally clears, the loss of trust and faith leaves the Pavlesic family-and the whole town-splintered and shocked. With her new perspective, can Rose finally forgive herself and let her family's healing begin? Kritters Thoughts: Quite the depressing read, that took quite a few pages, or a lot, to get to the heart of the story. There were days upon days of our main character Rose complaining about life and her family and I just didn't see the book going anywhere at all. There was little set up for the town before the smog rolled in and would have liked more of an emphasis on how this city was going to be impacted by the disaster. I was intrigued that this book was going to be centered around a disaster that affects the town, but it took way to long for the disaster to happen. The build up of the Rose's personal turmoil overshadowed the main star that I believed to be was the smog and the affect of it on this town. The ending brought closure, but it took too much to get to the heart of the story. I appreciated where the story ended.